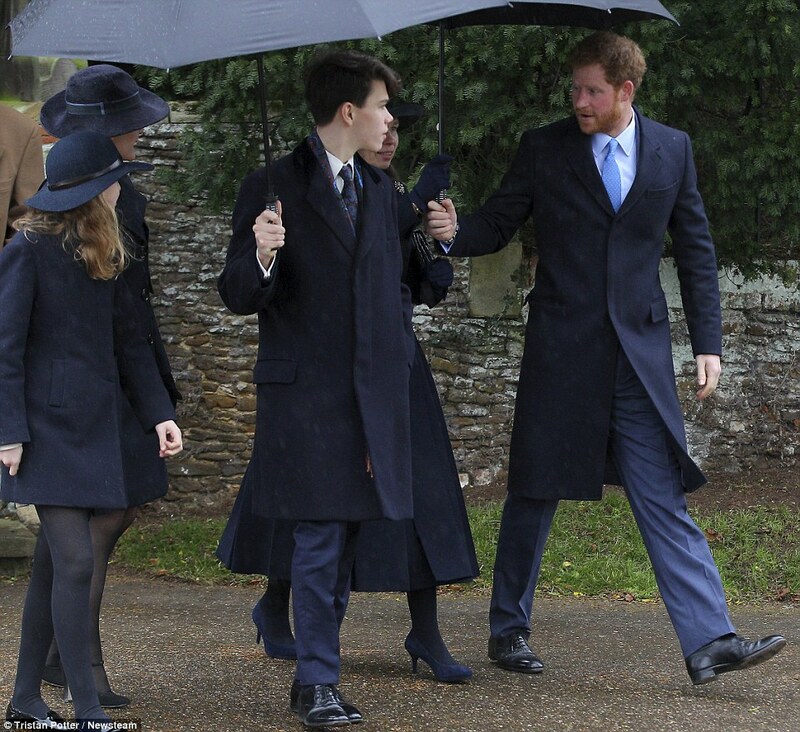 As they do each year on Christmas Day, members of the British Royal Family attended church this morning at the Church of St. Mary Magdalene near the Sandringham Estate. Queen Elizabeth led her family in a new bright red hat and coat with grey and black mottled faux fur trim. The hat, with a flat crown covered in red fabric, features a matching faux fur brim. Duchess of Cornwall topped her grey and black embellished coat with a black felt hat with flyaway raised brim. The hat is simply but effectively trimmed in a wide stripe of silk around the brim. Camilla’s hats are often lavishly embellished and this more streamlined piece is a nice contrast for her. Duchess of Cambridge wore a new hat in hunter green felt. The perching saucer shape on this piece is supported by a large poinsettia-like flower at the back which that gives much texture and interest to the hat. The colour is lovely on Kate and the hat was showed off to great effect by her chignon. Designer: Looks like Lock & Co.
Countess of Wessex looked wonderfully elegant in a grey tweed coat with matching hat. The cocktail hat, with a beret base, features a tall rim at the top of the hat. The small hat is given further visual punch with trimmings of a large twist of coordinating grey straw and a swath of black net tulle (see the hat in greater detail here). Dove grey is an unexpectedly lovely colour on Sophie and I thought she wore the piece well. Lady Louise Windsor stepped out in a simple black tam trimmed with a small bow at the side. This piece seems to mark Louise’s entry into the realm of hat wearing which, excitingly, gives us royal hat fans one more hat wearer to watch. Princess Anne repeated the feather trimmed cream straw hat we first saw her wear at Ascot earlier this year. This outing, she turned the feather encrusted, raised brim to the side (instead of at the front, as she wore last time) and this small change makes a vast improvement for this hat. It is still not my favourite piece although I thought Anne looked very well put together in her green tweed coat and chocolate accessories. 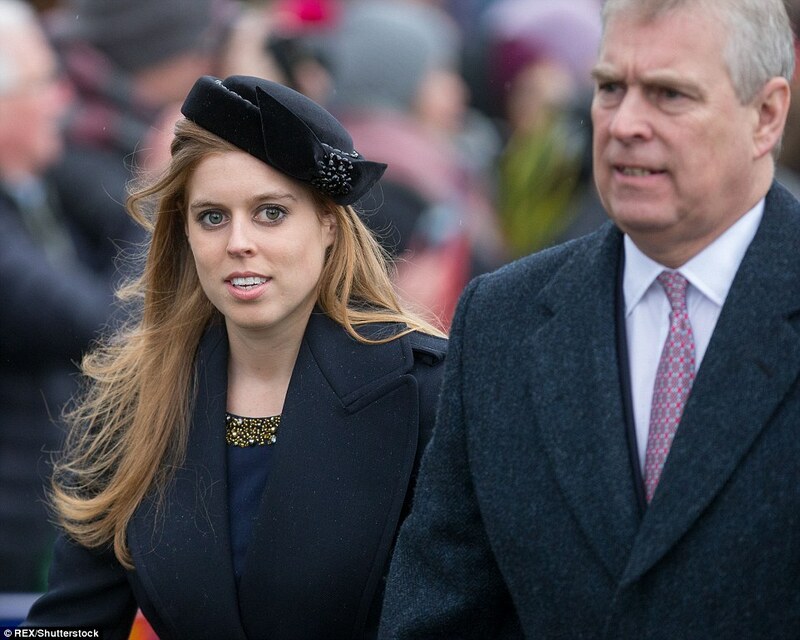 Princess Beatrice wore a new bespoke piece in black velvet. (see a better view here). The bumper brimmed hat is trimmed with beaded detail around the crown and a flat bow with beaded centre on the side of the brim. Placed at a jaunty angle on her head, the colour and scale of the hat made it a beautiful piece for the young princess. Princess Eugenie repeated the dark teal straw cocktail hat with black crin swirling trim we saw her debut at Ascot this year. The hat’s beaded brooch trim at the top its base adds a festive touch that makes it a great choice for Christmas and I was happy to see it worn again today. Lady Sarah Chatto wore a simple black straw hat with simple rolled brim. Sarah’s personal style tends toward the simple and streamlined and while not as memorable as other hats worn today, it fits well with Sarah’s aesthetic. And finally, Viscountess Linley wore a chic fedora while her daughter, Margarita, wore a relaxed Garbo hat. Both pieces were in fashionable navy blue. This brings the total number of hats seen today to eleven- which ones stood out most to you? This entry was posted in Great Britain and tagged Countess of Snowdon, Countess of Wessex, Duchess of Cambridge, Duchess of Cornwall, Lady Louise Windsor, Lady Sarah Chatto, Princess Anne, Princess Beatrice, Princess Eugenie, Queen Elizabeth. Bookmark the permalink. Finally back at commenting after being away at family Christmas gatherings. HM looks great in red and I like that the fur collar and sleeve endings help break up the color scheme, but the fur is not successful on the hat, and ultimately makes it look cheap in my opinion. It’s a shame we weren’t able to get better views of this one. Camilla was my favorite of the day. She looked absolutely stunning in this entire ensemble. The hat is large as a Camilla hat should be, but the simple lines keep it down to earth and pairs very well with beautiful coat, boots, and choker necklace. Kate was a close second for me since she wore my favorite color (green!). Nice to see something new for her, but I would like to see a full hat on her again to completely change things up. Sophie’s cocktail hat was another success and would love to see it again. I’m not so keen on her beige shoes with an all-grey ensemble however. Louise’s beret was simply perfect for her. Was very excited when I saw it on Jane Taylor’s Instagram. Anne always looks amazing in this green coat, and the placement of this hat on her head is much improved over the last outing. Brava! I’m honestly a little disappointed at how boring the hats were for Beatrice and Eugenie. The looked very well put together, but I was expecting a little more excitement and/or color. Sarah Chatto’s hat very much fits her personality, although the all black is a bit too funereal for Christmas in my opinion. Also, I’m not that old, but seeing her sons mostly grown-up reminds me I’m not as young as I think I am (seeing some extended family members at Christmas did the same thing to me as well haha). Hope everyone had a Happy Christmas! I like all of these hats! Some more than others, but I don’t think there are any duds. Kate’s is great, and if I were seeing her in this for the first time, I’d be raving over it. But it’s such a familiar shape on her, that I won’t go quite that far. Still a really good example of the genre, though. The only thing I’m slightly uneasy about is that in all of the pictures I’ve seen, the green of the hat doesn’t match the green of the coat, and isn’t really different enough to make a decent contrast. Camilla’s is perfect with her outfit, the scale making the statement but otherwise very simple. Anne’s is good as part of her complete ensemble, she looks elegant. And Sophie’s is both a good hat in itself and perfect as part of a wonderful outfit. Aussie Princess Caroline, I agree with all your analysis of this event, except that you are incorrect about Princess Beatrice donning a repeat hat, as HatQueen stated that the hat was new, and I don’t recall ever seeing her in this hat. Her Majesty looked amazing in her red coat. Very festive! I think my favorite hats are a 3-way tie between The Duchess of Cornwall, The Countess of Wessex and Princess Beatrice. Merry Xmas and Happy New Year to our HatQueen, Royal hat wearers, and all the readers of this column. I enjoyed seeing the British Royals on their annual Xmas church attendance. The winner in the style stakes this year was the Countess of Wessex in my eyes. The dove grey colour of her outfit was just right for her, and the design was wintery, and just right for church. Her hat was innovative, winter appropriate, church appropriate, and had the height to make her stand out in the crowd. I thought the Duchess of Cambridge came a close second. Her green outfit and hat suited her well, and her chignon looked neat, and that brooch was interesting. I am in two minds about Her Majesty’s clothes and hat. The red colour was just so Xmas appropriate, but the heavy faux fur trim on not only the hat, but the collar and cuffs too, was fur overkill. The Princess Beatrice donned a repeat hat, which although a cute pillbox, wasn’t blessed with enough wow factor to justify a repeat at this major Royal Family event, and much the same could be said for her sister, Princess Eugenie, with a cocktail hat that I like in teal, but which isn’t new, and whose coat looked too tight in the waist area, though the turquoise colour was really striking on her. Lady Louise looked so cute in her tam. The Princess Royal’s light green coat was a great design, and the chocolate accessories were so complimentary to it, but her hat was over-trimmed, and the beige straw looked so wrong at a winter event. Lady Sarah Chatto’s coat length was too long for her petite size, and the hat was boring and straw is all wrong for winter. I liked Viscountess Linley’s fedora and her daughter’s Garbo hat looked good, and it’s hard to go wrong in Navy in winter or at church. The Duchess of Cornwall wore a rather huge hat for a church service, though I did like the simple arched shape, and the navy colour. The trim on her coat was rather busy. The moth brooch was overkill on an already busy design, and I am not a fan of bug jewellery at the best of times. The Queen looks festive in red. There is a little too much fur, especially around the collar, for my taste. The Duchess of Cornwall looks great in the hat and that fabulous coat. Duchess of Cambridge looks good, too. Not too enamoured with the other outfits, although Princess Anne’s coat is well-tailored. Love the Queen’s outfit, the colour is superb on her (although like Snug Harbour I think there’s a loop of trim or summat extra on the front of the hat) so will reserve my 10 out of 10 until I get a clear look at the chapeau. There’s much great style going on among the female members of the party – Camilla’s coat and hat, Katherine’s hat, Beatrice’s coat (but not her shoes, never her shoes) and Sarah’s fabulous coat. Sophie squeaks in, but I did hesitate over the belt and the rise in the hem at the front (and her shoes look beige on my screen). It’s nice enough and suits her colouring but it just seems as if it could have been better. Anne always gets a pass from me, simply because she’s Anne (and we share the same birthday!). And let me also send a bouquet the way of Prince Phillip’s coat. Very nice. I think Queen Elizabeth’s collar is fabulous. The white/light gray in the fur makes a spectacular contrast to the bright red coat. The cuffs are fine, and the hat is interesting, to say the least. It’s hard to see through the umbrella, but it looks as though there’s red trim on red fabric on the hat. The fur on the hat seems to have its own pattern pattern, perhaps an ornament in the front too? The Queen must like fur trim for Christmas at Sandringham. I keep hoping that the outfits will be paired down, losing all the fur but keeping everything else, but the fur is what makes this outfit pop! I prefer today’s fur hat to the solid fur ones, but perhaps a little less fur would accomplish the same effect but lighten the hat’s appearance. The Duchess of Cornwall the Countess of Wessex both look fantastic, but it’s too bad the Duchess of Cornwall got stuck with the white umbrella. HM sure looks festive, I’m just not sure if it’s a bit too much fun fur. It’s a fantastic colour on her though, and it’s quite a glamorous look. Camilla’s outfit is a winner, I love that coat, and her hat is a great variation on her normal theme. Not sure about Kate’s mismatched greens, though Sophie’s look is classic glamour. I usually don’t like what Prince Edward’s daughters wear, but today they look very nice. Sophie’s hat is great – but it sure would be irritating to sit behind her in that if you wanted to see anything ahead! Do you mean Prince Andrew? Prince Edward has only the one daughter and she’s still quite young (Lady Louise in the tam o’shanter). I thought the royal ladies all looked lovely. The Duchess of Cambridge looked especially lovely in the dark green, and I liked her hair pulled back with the hat. It was a wonderful choice and she looked very polished and effortlessly elegant. Lady Louise looked charming and I do look forward to seeing her future choices as well. A good day for Royal hats and the ladies that wear them.